Howdy! Thanks for visiting our site and for your interest in our products. You may wonder: How did we get started? 3D Belt Company formed in 1988, initially as a family venture between several members of the Dees family – a dad and two brothers. We started production in Schulenburg, Texas with local talent making belts for wholesalers. 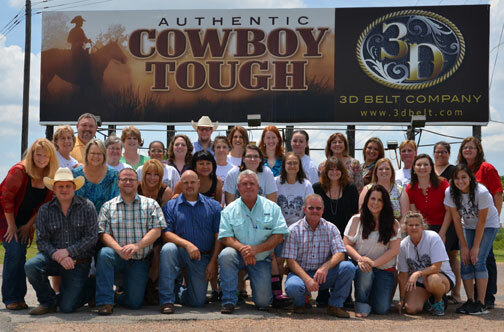 Over time, 3D Belt Company transitioned to a wholesaler and ownership changed to Steve Dees. We now work with artisans in multiple locations to bring you classic, fashion-forward and work accessory product in a heritage brand. While we started making men’s belts, we have expanded our line to include: women’s belts, jewelry, pistol cases, cell phone cases, home décor, knife sheaths, spur straps, wallets, buckles, hats, leather care, gloves, knives, and travel bags. We have also grown our brand to encompass multiple labels including 3D Belt, which is our classic line for men and boys; Angel Ranch for ladies and girls fashion belts; Silver Strike jewelry as well as buckles; handmade artisan jewelry by LoulaBelle; Badger for the outdoor enthusiast; and Western Classics for our value-minded consumer. We also carry accessory product for our licensee partner – Rocky and Georgia. We are still family-owned, and we rely on a fantastic group of local people in our corporate office. They handle everything from administration to receiving and shipping. We also have a sales team that covers all regions of the United States. We will take outstanding care of you with exceptional customer service as well as quick delivery of our accessory product.